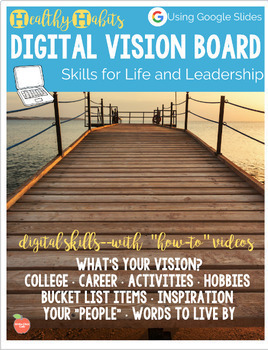 This lesson is designed to help students envision and articulate their goals and dreams...digitally. 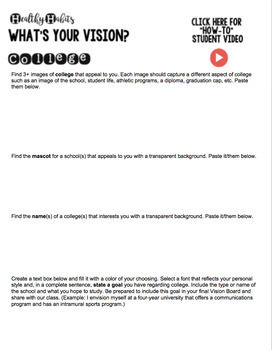 Using images collected through prompts on Google Slides, students will identify their values and intentions. 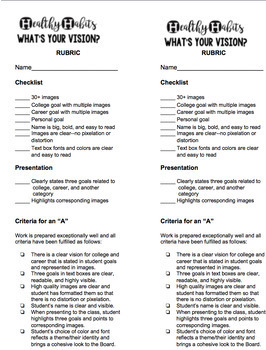 Students will assemble their final Vision Boards and present them to the class by sharing three goals and highlighting the corresponding images. 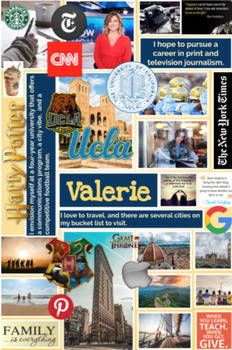 Everyone can benefit from a Vision Board. While I designed it for my 9th Grade AVID class, I recommend it for ASB, College and Career Education, Character and Life Skills. Use it to kick off the New Year, Genius Hour/Twenty Time, or send your students off with an end of year treasure. You can confidently upload the assignment to Google Classroom, or the delivery method of your choice, and know that students need only press PLAY to see how to complete the tasks. This lesson is also available in a Power Point format, but instructional videos use the Google platform (the majority of the skills will transfer across platforms).